This year at AWP, we’re going all out. The conference is coming to The Conium Review‘s home city of Portland, OR. We’re doing an event every night of the conference, starting with “Books & Brass: An Evening of Prose, Poetry, and Live Jazz” on Thursday, March 28th. Next, we’re hosting a “Literary Masquerade” on Friday, March 29th. Finally, we’re pleased to announce the lineup for our final event, “The Northwest Micropress Fair After Party” on Saturday, March 30th. 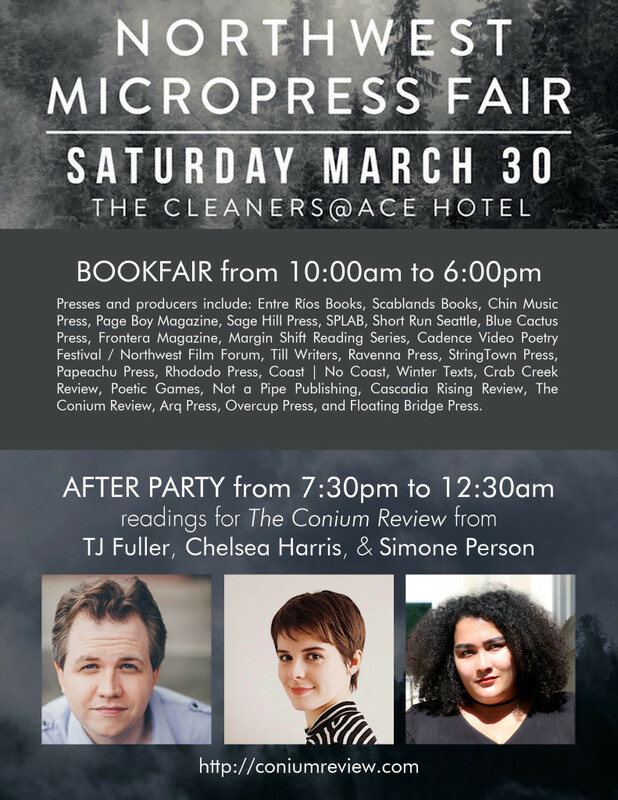 This particular event follows the Northwest Micropress Fair, which is an independently organized book fair held in the Cleaners at the Ace Hotel. We’ll be tabling at this micropress fair and we’ll also have a booth at the main AWP Conference bookfair. We’ll be selling books and doing author signings at each location. The After Party officially begins at 7:30 when the doors of the Cleaners at the Ace Hotel reopen for business. The readings start at 8:00pm, with music to follow and a cash bar available. The Northwest Micropress Bookfair and After Party includes a ton of presses, including Presses and producers include: Entre Ríos Books, Scablands Books, Chin Music Press, Page Boy Magazine, Sage Hill Press, SPLAB, Short Run Seattle, Blue Cactus Press, Frontera Magazine, Margin Shift Reading Series, Cadence Video Poetry Festival / Northwest Film Forum, Till Writers, Ravenna Press, StringTown Press, Papeachu Press, Rhododo Press, Coast | No Coast, Winter Texts, Crab Creek Review, Poetic Games, Not a Pipe Publishing, Cascadia Rising Review, The Conium Review, Arq Press, Overcup Press, and Floating Bridge Press. This will be a big event on the final night of the conference. Don’t miss it! Reading for The Conium Review are TJ Fuller, Chelsea Harris, and Simone Person. Find this event on Facebook. TJ Fuller writes and teaches in Portland, Oregon. His fiction has appeared in Hobart, Vol. 1 Brooklyn, Jellyfish Review, and elsewhere. He won the 2017 Flash Fiction Contest at The Conium Review. Chelsea Harris has appeared in The Portland Review, Literary Orphans, The Conium Review, Grimoire, and Smokelong Quarterly, among others. She received her MFA from Columbia College Chicago and currently lives in Washington State.